THE beach next to the famous tourists hotspots of Goa, like Club Titos and Mambos, is disappearing. The maximum erosion has occurred about 250 metres north of the 17th century Aguada Fort where 25 metres of beach disappeared in two years between 2004 and 2006, said a report by the National Institute of Oceanography (nio), submitted to the state chief secretary. 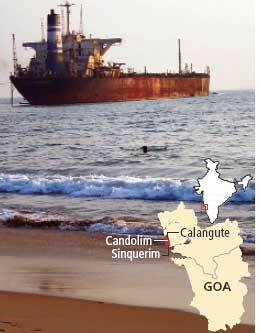 The nio found that the 1.1 km shoreline from Calangute to Sinquerim is under threat because of a trans-shipping vessel, River Princess, washed ashore and parked there since 2000. The state water resources department has said six other beaches too are eroding. The report further says the constant deposit of sediment near the grounded vessel was the cause of erosion around it.The vessel is in the wave breaker zone and the area between the vessel and the shoreline has become sheltered zone that obstructs the southward movement of the sediment. The report warned if the vessel is not removed, erosion would continue south of it; the Taj holiday village and the Fort Aguada beach resort lie south of the beached ship. nio scientist M T Babu said removing the ship would contain the damage. Once the natural flow and littoral drift is restored, the beach will get enough supply of sand and normal beach nourishment will take place in course of time, Babu said. The water resources minister Filipe Neri Rodrigues said rampant extraction of sand for construction is causing erosion in six other popular beaches including Coco and Candolim. District collector R Mihir Vardhan said geo-tubes are being erected along the shoreline to arrest further erosion. Environmentalist Verner Costa Frias said geotubes are a temporary measure. Had the geotubes been installed five years back, the damage would not have been so heavy, he said.